Opened in 1979, Pagliacci Pizza on the Ave launched a beloved local chain that now has more than two dozen locations. The original pizzeria closed its doors for good on July 26. 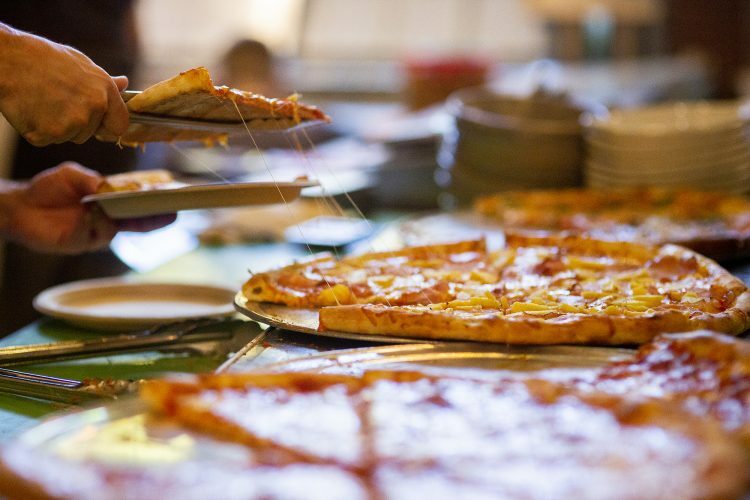 Perhaps no food evokes the college experience more than pizza. Late-night pizza shared with friends. Fuel for those brutal study sessions. A quick slice at your favorite spot before or after a night out. For many Huskies, that favorite spot was Pagliacci Pizza on the Ave, the main drag of Seattle’s University District. 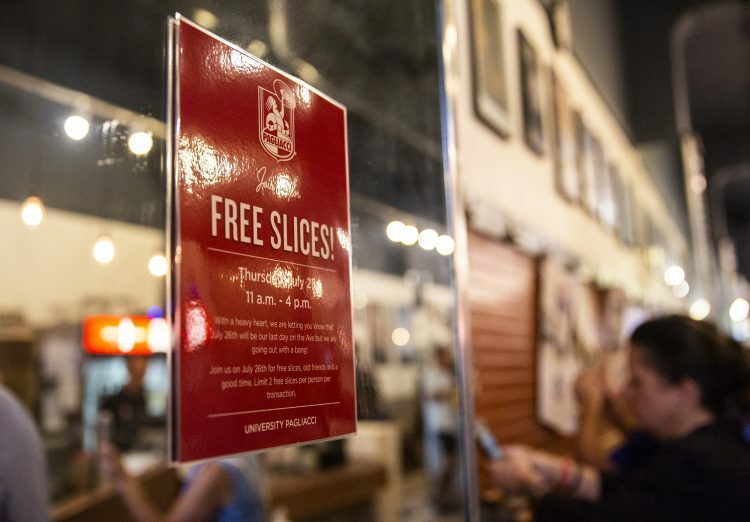 On July 26, the Ave location closed its doors forever, giving out free pizza as a thank you to its customers. Pagliacci is a Puget Sound pizza institution, with 25 locations in the area (including other U District spots at the HUB and Lander Hall). It all began with the pizzeria on the Ave, which Dorene Centioli-McTigue opened with her brother and cousin in 1979. It may not have had a sign or a cash register, but it had soul and personality—later captured by the Italian movie posters that covered its walls. Justin Wehrell, center, laughs as he assembles a pizza. Assistant manager Douglas Dixon tosses dough. 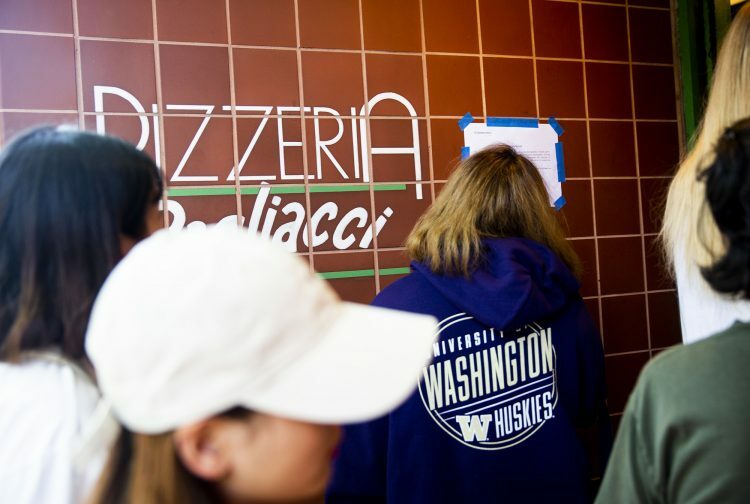 UW students wait in line for free slices of pizza. Because students don’t turn down free pizza. 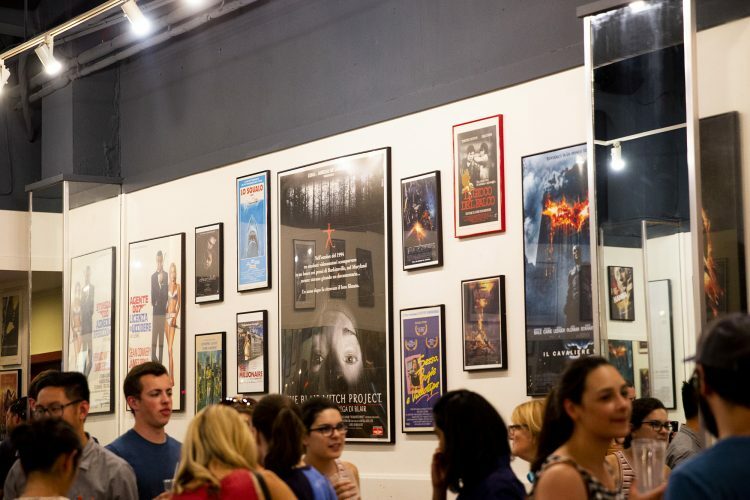 Movie stars look down from the walls as pizza fans enjoy a final slice (or two) from Pagliacci on the Ave. When the UW Alumni Association posted about the restaurant’s closing on Facebook, comments came flooding in. For some, it was their first encounter with New York-style pizza. For others, it was their college job. For everybody, it was the backdrop to beloved college memories. Pagliacci’s departure is just another chapter of incremental change for a neighborhood in transition. Next to the pizzeria is an empty lot that will soon be a Target. A block away, construction crews are building the U District’s first high-rise, a 24-story building that will feature retail and underground parking, along with 227 apartments. The transition intensified when Sound Transit began building a light rail station in the heart of the U District, at NE 43rd St. and Brooklyn Ave., in 2012. The station is scheduled to open in 2021. Seattle City Council approved an upzone for the neighborhood in 2017, raising the maximum building height and paving the way for a transformation that some people worry will change the neighborhood’s character and push out its poorer residents. 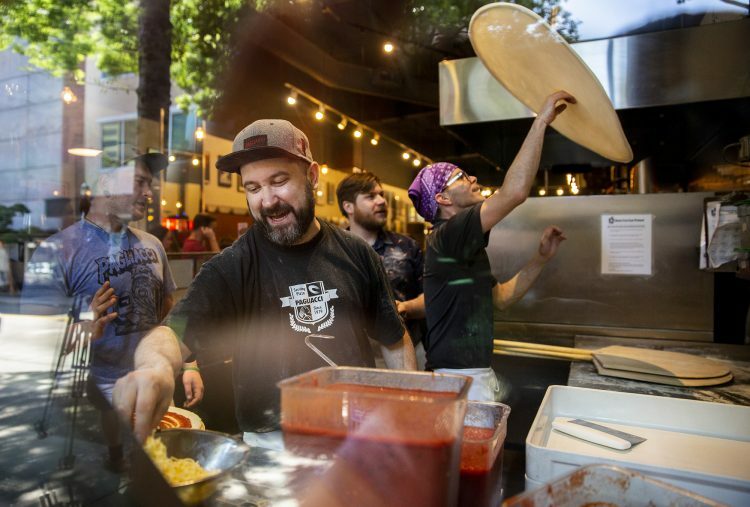 But these changes in the neighborhood aren’t why the U District Pagliacci is closing, says Jeff Woodruff, Pagliacci’s Vice President of Operations. “We’re listening to our customers and responding to what they need from us,” he says as he looks at the line of customers down the block on Pagliacci’s last day. More of their business is centered around delivery, and the location on the Ave doesn’t have space for parking. The company is shifting toward dine-in locations that can also be sites for its delivery business, like the renovated Sand Point location opening soon. One of the people waiting in line on Pagliacci’s last day is Dave Crowther, who now lives in Seattle’s Wedgwood neighborhood. Crowther came to this spot when he was a student at Roosevelt High School, not long after it first opened. “I’m here to pay homage to a good place for cheap eats with a great ambience,” he says. When asked about his favorite Pagliacci memories, Crowther remembers an employee who had special needs. Seeing her working and thriving made a big impression, especially when he went on to have a son with special needs. Misty Shock Rule is a communications and media editor for the UW Alumni Association.